Scientology Pays Reporters To Probe Newspaper The Church of Scientology has hired two big names in journalism to investigate coverage in the St. Petersburg Times critical of the secretive religion. As newsrooms downsize, will we see more cases in which the target of a newspaper investigation pays reporters to turn the tables? 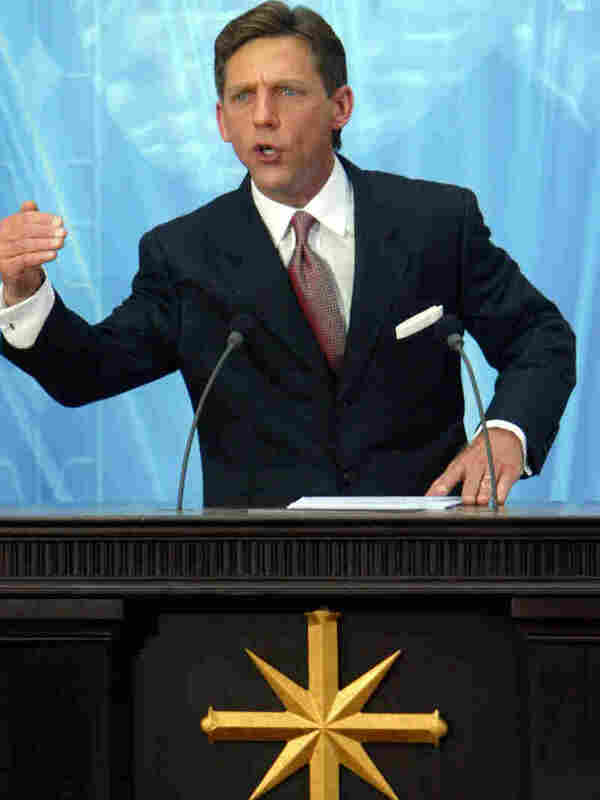 Church of Scientology leader David Miscavige, shown here in 2004, was the focus of an investigation that ran in the St. Petersburg Times last year. The church called the report a lie and hired two journalists to investigate the coverage. The Church of Scientology has hired two big names in the world of investigative journalism to report on coverage in the St. Petersburg Times, a Florida paper, critical of the secretive religion, whose spiritual headquarters is based nearby. The paper had previously won a Pulitzer in 1980 for uncovering Scientology's inner workings. 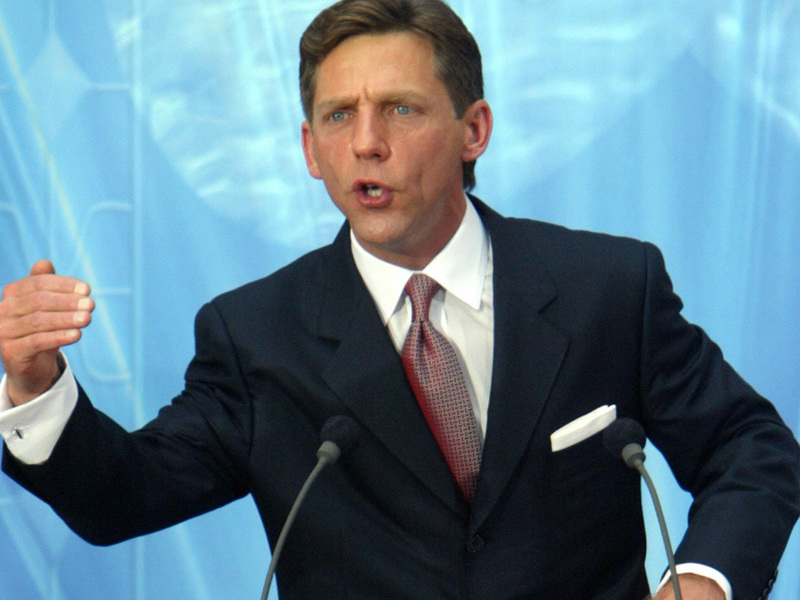 Last year, the paper accused Scientology's leader, David Miscavige, of physically beating his subordinates, based on interviews with former high-ranking Scientologists. Church officials said the paper's report was a total lie. They criticized the newspaper's sources and methods as unfair. But instead of just complaining, church spokesman Tommy Davis says they decided to do something about it. "To be honest, I think we just took a playbook from the media. Media pay reporters all the time to investigate things," Davis says. So the Church of Scientology hired former 60 Minutes producer Christopher Szechenyi and Pulitzer Prize winner Russell Carollo. No one is saying how much they were paid. The two agreed to write a report about the newspaper's coverage of Scientology. As part of their investigation, they called the executive editor of the St. Petersburg Times, Neil Brown. To be honest, I think we just took a playbook from the media. Media pay reporters all the time to investigate things. "They wanted us to participate in a study of our work paid for by the subjects of our work. It seemed odd at best," Brown says. Brown says the newspaper refused to answer the reporters' questions. He says the church had already hired three law firms to raise questions about the newspaper's work. "When you've been threatened with lawsuits, it doesn't make sense to have a conversation with subjects who are threatening you about the work. So, we ultimately had to say, this isn't an independent, objective review, and we've got a lot of journalism left to do and we're going to go forward with it," Brown says. "I do think the St. Pete Times comes from the 'can dish it out, but can't take it' school of thought," Davis says. Davis says church officials have no plans to release the report to the public. But that didn't stop Davis from talking about the report with The Washington Post, calling the study "highly critical" of the Times' coverage. The two reporters declined to be interviewed. In a statement, they say they acted ethically and maintained complete editorial control. They wanted us to participate in a study of our work paid for by the subjects of our work. It seemed odd at best. Loren Ghiglione, who teaches media ethics at Northwestern University, wonders what it means when investigative reporters become private investigators for hire. "When do you stop being a journalist?" Ghiglione asks. "It does raise the question, when you become the employee of an organization that is essentially not a news organization, and may be trying to go to war with another news organization." Ghiglione says as newsrooms downsize, great reporters are having to look for other sources of funding — and Ghiglione suspects this won't be the last time that the target of an investigation seeks to turn the tables on the media.